Just a quick reminder that we have a couple of Open Houses coming up soon. I will be in Chicago this Thursday, Feb. 13; and at an Open House on campus on Feb. 17. At both Open Houses, we’ll have a couple of students joining us to talk about their experiences in the MSPL this year. This year, for the first time, MSPL students are going to participate in a mock Markman hearing. What is a Markman hearing, you ask? When a patent is litigated (think Apple v. Samsung [smart phones], Association of Molecular Pathologists v. Myriad [breast cancer genes and diagnostics]), one of the important steps of the pre-trial process is the Markman Hearing. This hearing is named for a case from 1996 in which the Supreme Court decided that a patent’s claim language is a matter of law (to be decided by a judge) instead of a matter of fact (to be decided by a jury). The outcome of that case is that now, before a patent infringement case goes to a jury, a judge will “construe” the claims via a Markman hearing. In the Markman, the two sides decide jointly which claim terms need to be clarified, and then each side briefs and then argues their positions before a judge. Cases can be won or lost at the Markman stage, since an unfavorable claim construction (ie, interpretation) can completely undermine one party’s legal position. In fact, many cases settle immediately after the Markman hearing. It’s important for a patent agent to understand how litigation works, since the patents which they write may eventually be litigated. The Markman is the most direct part of that process — why did the patent agent or patent attorney choose a particular word for a claim, and what did that word mean when it was chosen? Our students will be taking claims and terms that were litigated in the recent Apple v. Samsung case, and briefing/arguing a couple of the more interesting claim terms. Our judges will be two practicing patent litigators — Rick McCaulley from Ropes & Gray in Chicago, and Tony Dowell from Taft, Stettnius in Indianapolis. Next Friday we’ll meet to learn about Markman hearings and identify the claim terms to brief, and then the following Friday the students will present oral arguments. Check back to learn how it goes! School has been cancelled yesterday afternoon and today — we’re having an unusually cold and snowy winter. Given that class was cancelled yesterday, but also taking into consideration that our professor for Patent Prosecution had driven all the way from Cleveland to teach, we held a virtual class meeting using Google hangouts. It was quite successful, actually! Cindy (the prof) did a great job, and I think it was a good exercise in conference-call and video-conference etiquette for our students. They learned that they need to be more responsive and demonstrative than they would normally be in class, since the prof is not able to read their comprehension as clearly as if in-person. And, possibly the biggest upside of holding the class virtually is that we don’t have to hassle with scheduling a makeup! We’ll be hosting two Open Houses in February, where we’ll talk about the MSPL, and our upcoming Chicago and online offerings. Other kinds of Intellectual Property?! By definition, the MSPL focuses on teaching our students about patents. How to get them, how to talk to people about them, what they’re good for (or not). But sometimes it’s important to step back and get some perspective. The point of having our students learn about these other kinds of IP is quite practical: clients have problems; and most clients have more than one type of problem. So, it’s almost certain that, at some point, every patent agent is going to see a TM or (c) and need to know what that means. … and whether or not s/he can provide legal advice to the person who’s asking a question (hint: NO!). I teach these classes, and even though they’re out of my area of specialty, I really enjoy them. This year the Robin Thicke/Marvin Gaye lawsuit over “Blurred Lines” is going to provide us with some fun subject matter when we talk about copyright. And, my favorite Diet Coke will make a special appearance as a teaching prop! Patent prosecution, from the inventor or applicant’s perspective, can be scary. Their patent application, which they have probably spent a lot of money to have prepared, isn’t going to become a patent after all??!! That’s not necessarily the case, though — as mentioned in Part I, it’s quite frequent that an applicant gets a rejection for a good reason! Here’s where a good patent agent or attorney is invaluable. The rejection will be made in highly legal and technical terms — and the patent agent or attorney will know how to rebut the rejection appropriately. They’ll be able to throw the legal and technical jargon right back at the Examiner and blow his or her argument to bits (formally known as “overcoming the rejection”). These skills aren’t something you just pick up — the MS in Patent Law teaches our students how to systematically approach rejections from the Patent Office, so they can help inventors get patents. After a patent application has been filed, a person at the US Patent Office has to review the application and decide whether the application deserves to become a patent. The person who does this review is called a Patent Examiner. The Examiner looks to make sure the application fulfills all of the requirements that the US Code sets out for a patent (mainly, 35 USC 101, 102, 103 and 112). The Examiner will reject any application that does not fulfill these requirements — ie, s/he won’t allow the application to become a patent. As I mentioned in a previous post, it’s not unusual for the Examiner to make a rejection the first time s/he looks at an application. Once an applicant gets a rejection, s/he gets to rebut it. In other words, the applicant gets to say why the Examiner is wrong. This process of rejection and rebuttal is known as “Patent Prosecution”. Sometimes people hear prosecution and think of going to court — but that’s not the case here at all! Patent Prosecution refers to the negotiation between the applicant and the Patent Office about whether a patent application should be allowed as a patent. In future posts: What does patent prosecution look like from the inventor’s perspective? What do MSPL students learn about patent prosecution? The MS in Patent Law’s spring semester starts on January 13 with the first class of Patent Prosecution taught by Cindy Murphy. This course is a very important component of the MSPL curriculum because patent agents spend so much time using the skills that this class teaches in the real world. Here’s the logic behind that statement: if your patent application gets allowed (ie, becomes a patent) right away, that means you didn’t ask for enough. It’s like selling your house — if your list price is too low, someone will just pay what you’ve asked without haggling over it. Patents are the same way: if the Patent Office lets you have one right out of the gate, you didn’t ask for enough. In subsequent posts: What is patent prosecution? What does patent prosecution look like from the inventor’s perspective? What do MSPL students learn about patent prosecution? We had our annual Christmas party a couple of days ago. 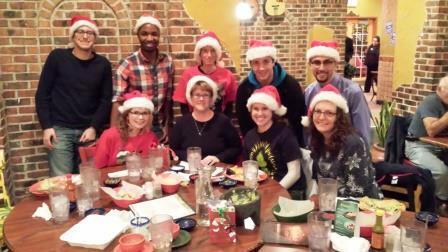 True to the holiday spirit, we had dinner at a local Mexican restaurant (yum!) and then went bowling. Cathi won the first round of bowling, and Karen won the second. Lest you think that we chose bowling because we’re both ringers, I’ll let you know that neither winning score was higher than 110. Maybe next year we’ll have some stiffer competition from our students! 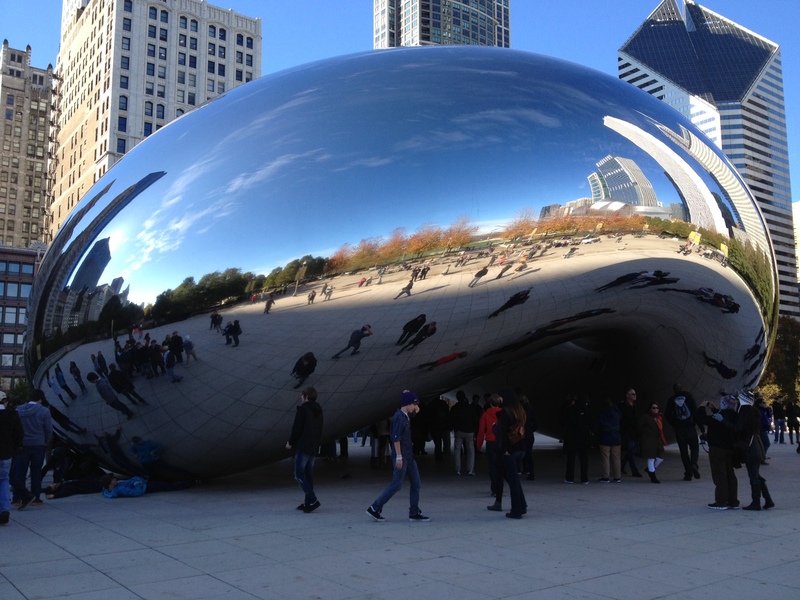 On Friday, the MSPL went to Chicago. We spent the afternoon in the city — the students had a couple of hours to explore, and then we heard from Chris Moreno about patent prosecution. Chris is a shareholder at VedderPrice in Chicago, where his practice focuses on patent prosecution. He gave our students an overview of the process and also provided lots of tips he’s learned from about 20 years on the job. It’s always a delight to have Chris provide this lecture at this time of the year! Thanks Chris!